Regular Meetings, unless otherwise noted, are held the 4th Monday of every month at 7pm in the Community Room at St. Mary’s Woods, 1257 Marywood Ln., Richmond VA, 23229. This year we are excited to announce that PBA is joining forces with the National Arboretum to celebrate World Bonsai Day with three days of vendors, demonstrations, workshops, activities for beginners, and study groups for existing PBA members. The World Bonsai Day Festival will be held at the U.S. National Arboretum in Washington D.C. Festivities will be located on, and around, the grounds of the National Bonsai & Penjing Museum. RBS Members are encouraged to prepare their own trees for the PBA member exhibition, volunteer, or attend the workshops and study groups. See Thomas if you have any questions. More detail and the daily schedule on the PBA web site. Spring is here and everyone is busy with their own bonsai. Personally, I have unpacked and organized most of my trees onto the benches and tables. I started some repotting, but have a lot to do and not nearly enough time. It’s a matter of repotting priorities so some may have to wait until next spring. I am also trying a new technique for the first time. Last fall, I purchased several large nursery trees with roots busting out of the pots. So I have chopped the trunks and chopped the root balls, and planted them back into my raised beds on top of ceramic floor tiles to recover and develop new lateral roots. I hope this works. I also found a great plum in the discount section of a local nursery. It had no label and seems to have been neglected, but was full of flowers, so I got it for a good deal. If you would like to stop by sometime and poke around my trees, just let me know. As I approach the end of my term as RBS President, I feel that it has been a successful, but difficult two years. When I started the term, I had a few goals, that with your help, we have accomplished or are almost there. We have updated by-laws and are currently rebuilding our website. We have a large and active club with a wide variety of outreach and activities that attempt to address the varied demands of our very different members. Yet we have had disappointments and changes too. We miss Dan and other members who have left us. Some events that we participated in for many years are no longer available or practical, so we continue to search for good public events to participate in. I am hopeful that we will continue to make progress as an organization, but that only happens with increased member volunteerism, which hasn’t been great of late. Lastly, I want to discuss the World Bonsai Day Festival. PBA’s Spring Festival and The National Arboretum’s World Bonsai Day events have been combined into the premier event for bonsai enthusiast in our region and everyone should to attend. There is enough to see and do, that it is worth spending two days up there. Make a weekend of it. In representing RBS on the PBA board, I pushed for activities that I felt would benefit RBS members, particularly the member study groups. Please register for the study groups ASAP since they are limited. In addition, I pushed for changes in the schedule for the PBA member tree show. In the past, tree drop off was on Thursday, and the show opened first thing Friday morning, which prevented most RBS members from contributing since we are not likely to go up Thursday. This year, the drop off has been extend through Friday morning, and the member tree show does not open until noon on Friday. The PBA Board agreed to this change because I PROMISED RBS WOULD CONTRIBUTE TREES TO THE SHOW. Prepare your trees for the show. I will personally transport them if you cannot. This is an important opportunity for RBS members to step up and show off some of our beautiful trees and raise RBS’s image. Lastly, please register as a volunteer for a few hours while there. The volunteer registration is being hosted on the RBS web page since I am coordinating the volunteers. Again, this is an opportunity to raise RBS’s image in PBA by being a major contributor. RBS has an immediate need for member volunteers. This is a member organization, and every activity that we do depends on member volunteers. We cannot operate without everyone’s contributions. Please contact Thomas if you can help with any of these things: car pool coordinator for the Word Bonsai Day Festival, election nominations committee chair and 2 nominations committee members, 2017 World Convention committee chair and members, 2 assistant librarians, and web page assistant. In addition, we need members to stand for officer elections for the 2016-18 term starting in May. Lastly, we need members to contribute articles, reports, and photos for our monthly newsletters. RBS 2016 Dues are now PAST Due: RBS 2016 dues are $25 per person or $30 per family, which includes PBA membership. Checks should be made out to RBS and can be paid at a meeting or mailed to Jack Frye, 3112 Bute Lane, Richmond, VA 23221. Only three members showed up for this first of a series for RBS, but they got a lot of work done and were able to offer each other advice and ideas on styling possibilities and techniques as they worked on their own trees. These study group/workdays have been planned due to member’s call for more time to work together and share techniques, and to complete projects. Please support these activities in the future, even if you just come to watch. February Meeting Report: Jack Sustic, National Bonsai Museum Curator by Randi H.
Jack Sustic, Curator of the National Bonsai Collection maintained at the National Arboretum, spoke at the February meeting and shared the history of the of the acquisition of the initial 53 trees, a gift from Japan. In 1976, Japan gave a gift of 53 Bonsai trees to America for the Bicentennial. 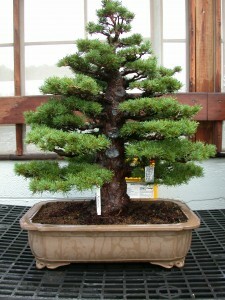 The trees were selected by the Nippon Bonsai Association, with funding for the tree provided by the Japan Foundation. The trees were crated and flown on a chartered jet to the United States. After going through quarantined before arrival at the National Arboretum. The National Bonsai & Penjing Museum, also established in 1976, is dedicated to the display, education and scholarly study of bonsai and related art forms. There are 3 pavilions that currently house about 150 trees. The pavilions in the complex are designed to house trees from each of three countries. The North American Pavilion, or John Naka Pavilion, Japanese Pavilion, the Chinese Penjjng Pavilion and an International Pavilion. Another organization that is critical to the success of the National Bonsai & Penjing Museum, is the National Bonsai Foundation (NBF). The NBFis a nonprofit organization that was created to sustain the National Bonsai and Penjing Museum. NBF also helps the United States National Arboretum showcase the arts of Bonsai and Penjing to the general public. The concept of an internationally acclaimed collection of bonsai and penjing was conceived by former Arboretum Director Dr. John Creech in 1972. The Japanese Pavilion was constructed as a result of the donation from the Nippon Bonsai Association of Japan, and became the home of the new specimens. The collection grew again in 1986 with the gift of Chinese penjing from Dr. Yee-sun Wu and Shu-ying Lui. The construction of the Dr. Yee-sun Wu Chinese Pavilion recognizes this important gift and provides a home where his gift can be properly displayed. The growing popularity of bonsai in North America was recognized with the construction of the John Naka North American Pavilion. In it resides one of the most extensive and diverse collections of bonsai from masters in North America, including American master John Naka’s Goshin, a spectacular forest-style planting of junipers. PBA brought us John Kirby for a double session workshop with RBS members. We did repotting, styling, and even got to watch a grafting demo on a pine tree. John emphasized the importance of developing good roots in good soil BEFORE working on trees. John was helpful, knowledgeable, and fun. RBS and the Great Big Green House welcomed 29 participants who learned some bonsai basics and created some interesting designs with junipers. For most, it was their first time and they did very well. We hope that each of them will continue to join us for future activities. Of course we want to thank The Great Big Green House for hosting us and all of the RBS members who helped out, especially Jack for leading the workshop so deftly, and also Ron, who handled all of the registrations. RBS does not exist without volunteers. RBS Past President Randi Heise will lead a discussion and demonstration on pruning methods for deciduous bonsai trees. Members should bring their own trees to prune as well as tools. This meeting will take place Monday, march 28, 7-9 pm in the Community Room at St. Mary’s Woods, 1257, Marywood Ln, Richmond. As always, if you want help or advice on your trees, feel free to bring them to the meeting a bit early and someone will be available to help you. RBS members are invited to bring their own trees to work on together Saturday, April 2, from 10:00am to 4:00pm in our normal location at St. Mary’s Woods. The point of a study group is that you can solicit advice and guidance from other members, or just come watch and learn. The long day gives you plenty of time to start and complete projects. Members should bring tools, drop cloths, refuse containers, and cleaning supplies as needed for themselves. Once again, RBS is delighted to have Roy’s expert skills once a gain for a double session workshop. Sessions will run from 1-4 pm and 5-8pm. Each session will cost $50 and will be limited to 5 participants at a time. You can register for one or 2 session, but you MUST BE A CURRENT (paid in 2016) RBS or PBA member. Contact Thomas to register. FOR SALE: Bonsai soil (regular), 5 gal bag and Shohin soil (fine) 5 gal bag. There also will be some beginner tool kits and individual bonsai tools for sale. Call Lee Abrahamson (320-1257) to place a special order. Lee will deliver at our next meeting.